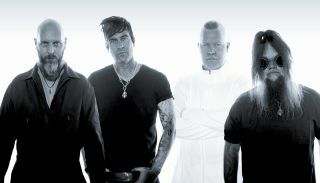 Metal band featuring former Mudvayne members to release new album, ‘The Real Now,’ in November. Audiotopsy, featuring former Mudvayne members Greg Tribbett (guitar) and Matt McDonough (drums), as well as Skrape vocalist Billy Keeton and bassist Perry Stern, will release their second full-length release, The Real Now, on November 2 via Megaforce Records. Today, Guitar World is premiering “What Am I?” the first single from The Real Now. You can check it out below. Guitarist Greg Tribbett says about the track: " 'What Am I?’ touches upon finding yourself and the true meaning of life. Life is ever-changing and you never know what is around the corner. Musically, I really wanted to concentrate on single note riffs in the verses. Something easy but mesmerizing. Then it goes to a wide-open chorus. The bridge is single notes, with underlying picking patterns that leave room for vocal melodies. Regarding the gear he used on the album, Tribbett says: “I used my Legator Guitars along with a Mesa Dual Rectifier and an Egnater Armageddon Head. The result is that you hear a combined sound on the record. I also used DR Strings for that crisp attack. I tried something different on this record and tuned down to A for all the songs, which gave me a low, aggressive vibe. And the guitars were recorded at Valve Studios in Dallas." The Real Now was produced by Audiotopsy, with vocal production and mixing completed by Dave Fortman (Evanescence, Slipknot, Mudvayne). The album is available for pre-order now.